My attempt to find a voice after a childhood of silence. Three days before she died, I visited my mother in Dandenong Hospital where they had finally given her a bed in a single room tucked away from the hubbub of the nurses’ station and the rest of the ward. The nurses had propped up the bed so that when I looked down at my mother’s face all I could see beyond the slight mound of her body under the white cover and sheets, pulled up to her chin, was her head. We were almost face to face, her head at chest level. ‘Mum, it’s me, Lis.’ She fluttered her eyes open and turned her face in my direction. Her eyes met mine then closed again. My mother had stopped talking several days earlier, around the same time she stopped letting people force things into her mouth. The concentrated cranberry juice my sister bought from the specialist delicatessen that one nurse had suggested might act as an antidote against constant urinary tract infections and the tiny spoons full of chocolate custard, which my mother once loved. The tart and the sweet, she no longer let them past her tongue. They dribbled down to her chin when we tried. They had given up on the intravenous drip that sent nutrients into her blood stream to keep her alive. ‘I think I shall live till I’m one hundred,’ my mother had said to me weeks earlier before the pancreatitis caught hold and left her in such gusts of pain she could not move but cried out in whimpers. My mother was never one to complain. Her optimism and cheerfulness, her wish to cause no one irritation or trouble had left her sick in the first place. She had not let people know she was in trouble until it was too late, and obvious that she needed hospitalisation, the last thing in the world she had wanted. We’d talked about it. Her fantasy of dying at home in her beloved room in Park Glen surrounded by family and friends. What family? Only one or two of us at once. Most of my siblings had modest intentions when it came to helping our mother in her fantasy of a quiet death at home. She was ninety-four years old, with no wish to die in hospital and no hope of dying at home. I looked across to the window across the flat grey roofs of buildings that flanked the hospital. The sky was grey and pockmarked with dark cloud. The room against the grey seemed even more white, bright and determined to keep my mother in its relentless spotlight. She kept her eyes closed. ‘How are you?’ I asked, the stupidest of questions in the circumstances and one she did not answer, only shook her head a little as if to let me know my words had registered. She kept her eyes closed and I sensed an unspoken message from her, one of I have no energy now, and no wish to talk to you. Should I have taken this personally? 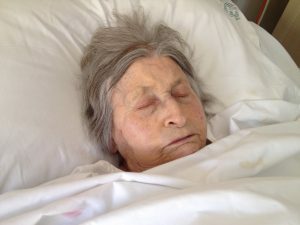 Should I have persevered in my wish to reconnect with my mother when she was soon to die, only I did not know this then. I knew only that her optimism had drained away in the last several days ever since the cheerful physiotherapist and equally bright occupational therapist had gushed into my mother’s room three days earlier as I sat with my sister, trying to coax food into her. ‘Of course, you can,’ said the first of the therapists. ‘Up and back into movement.’ They peeled off the layers and my mother’s thin legs stuck out under her regulation gown. The purple bruises on her calves glowed dark against the white of the sheets and the black marks along the inside of each arm from where they had drawn blood looked angry, against the cheerful banter of the two therapists. My sister and I moved back into the curtains that surrounded my mother’s bed and watched each young woman take her place on either side of the bed behind my mother. Each took a shoulder and my mother winced as they first tried to readjust her position on the bed so that she could shift into bed leaving position. ‘She has a sore shoulder’ my sister said, and the physiotherapist smiled. ‘We’ll be gentle.’ Then they pushed and pulled my mother, lifted her feet over the edge of the bed such that her toes were ready to reach the floor and my mother let out soft sobbing sounds. ‘Of course, you are. Now, at the count of three we’ll heave you up and onto your feet. Don’t worry if you feel wobbly. We’ll each have you and the second therapist rushed over from her side of the bed and took her place on the other side ready for each to heave my mother’s small frame up onto its feet. It was as if my mother’s feet no longer belonged to her, any more than the rest of her body belonged. Her body was a broken-down car, a toaster that no longer popped up bread, a violin that had lost all its strings. ‘I can’t,’ my mother said as her feet hit the lino and the two therapists beamed at their success. At least they did not let he go. They held firm, as she hung there in the air like a puppet held upright by its puppeteer and soon enough they decided to stop. ‘Back to bed with you,’ they said and my mother yelped in pain as the one brushed against her shoulder while straightening her pillows, after she had pulled my mother into shape in the middle of the bed and recemented the blankets. My mother’s silent protest. Her refusal to go on carrying the weight of her own body won her this quiet room, won her the right to seal her lips against all offers of nourishment, led stopping all injections and intravenous efforts. My mother was left in peace at last, only hospitals are busy places in which people are meant get better and then leave. There was no room for my mother there. Now in her single room alone with me, I asked my mother did she want me to leave. ‘I just want to sleep,’ she muttered, eyes closed. But I could not bear to leave her alone. Not in that moment. Not for her and not for me. I pulled away from her bedside and stood to one side where the hospital curtains draped in green folds to the floor. I leaned against the post inches from her bed but far enough away that she could not sense my presence. Or so I thought. I watched her face in its stillness, in its resignation, in its determination to blot out the world and for an instant sensed my power over her. My mother who had always been thirty three years older than me, and thirty three years wiser and thirty three years more certain of her place in the world and thirty three years more determined that my way was wrong and I sensed that I could still keep my feet on the ground while she had given up. Her eyes flickered and she turned her face towards me, ever so slowly, and opened her eyes to see me there. She said nothing, but I got the message. Go away leave me alone. Do not watch over me. Was it that my mother could read my thoughts? Did she imagine my triumph over her now she was soon to die and her thirty three years over me would diminish daily until I caught up with her? If I lived long enough, and even if I didn’t, it shouldn’t matter. She would no longer be here to remind me of my failure to be the daughter she had wanted, her name sake in name only, but not her chosen one, not the daughter who came into her mind when she thought loving thoughts about her family. The sting in these words years after her death and all I remember that moment when I stood against the wall in Dandenong Hospital and watched my mother in her hopelessness, knowing she would hate anyone to see her without makeup, without her hair neatly combed, without her teeth and with flecks of thrush forming at her mouth, which she tried to shift with her tongue only to find more where they had left. That she was no longer at her best. My brother once said to me: You were Mom’s favorite. I said: So what? Did you want to be her favorite? We loved our mother. Our mother loved both her sons. That’s not to say love made everything smooth and easy. It’s rarely smooth and easy, as you say, Glenn, even with love, but it can make things so much better. To my mind it can be as much a burden to be a favourite as it is to be not so, though to be ‘hated’ is another thing altogether. Not that my mother hated any of us and her favourites tended t be burdened by that position which was most likely pretty fluid, as in it changed over time. Thanks, Glenn. 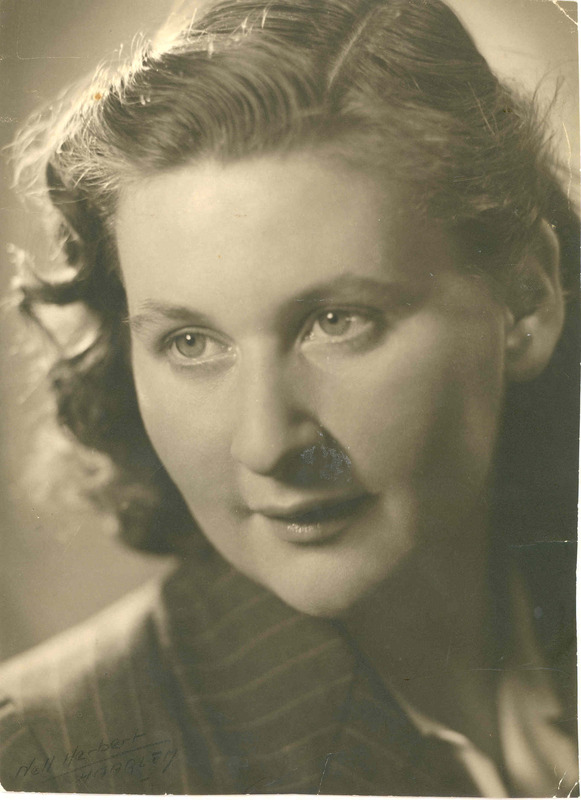 Some days, I count the years and think – foolishly – that when I hit the 20yrs mark of my mother’s death (next year! ), I’ll experience what the world calls closure. But deep down I know I haven’t a hope. It gets easier, she gets smaller in my memory. Literally shrinking. But only my memory of her physical shape. I often watched patients refuse food in their last days and came to the conclusion that this is the last active decision they can make to control their lives. But in my husband’s last days, I felt guilty that I was not feeding him (due to vomiting). When I expressed this to our palliative care nurse, she said ‘Every mouthful of food you give him will just prolong this process.’ He died 3 days later. Dying’s not easy, Karen and most of us don;t want to face it. the medical establishment most of all, I reckon, except perhaps those in palliative can.Certainly that refusal to eat is a sure sign. Thanks. I am twenty-one years older than my daughter. I, as you rightly say, will always be twenty-one years older than her; the rest I’m not so sure about. My daughter just turned thirty-eight. We had lunch a couple of weeks earlier (just a block away from where you and I had coffee) and I remember looking at the fine-looking woman who approached me outside the pub-restaurant we habitually meet at and wondering how much I had to do with all that. Some, obviously, and not all the best bits but, as with so many kids, I suspect she got to be the successful woman she is these days—she’s just received a significant promotion at work—despite what her mother and I did and not because. Larkin was so right. Wisdom is something we assume comes with age. We confuse it with experience. Even if we learn from said experiences that doesn’t mean we’ve gained even a modicum of wisdom. I’m clever—cleverer than my daughter despite the fact she’s much better qualified than I am—and because I’m clever I’ve been able to conjure up an air of wiseness but much of life still confuses the hell out of me and I’m only glad I’m in a position nowadays where I can avoid the bulk of it. My daughter, on the other hand, is exactly the kind of child anyone who knew the twenty-odd-year-old me would’ve expected me to father: successful, smart, driven, ambitious, opinionated, self-assured. When did I lose all of that? Along the way somewhere; it no longer matters. My daughter is also more certain of things than I was at her age. She hatches plans and executes them. I did too in my twenties but gave it all up without a fight. Other than death and taxes there’s not much I’m sure about anymore. I don’t want to be watched over though. I put on a front when I see my daughter. I want her to believe she’s not needed, that everything’s tickety-boo. Maybe she’s doing the same. You never know. Of course the nice thing about being an only child is the assurance you’ll always be the favourite. I, as you might recall, have a brother and a sister. It came as a great surprise to me to discover after my mother’s death that I’d been her favourite. I never saw that coming. I regarded myself as the black sheep. The perverse thing is so did each of my siblings. There’s a poignancy i what you write here, Jim, that makes me wonder what it might be like if you were to talk to your daughter about what goes on underneath and that she might do likewise. Have a different type of conversation. It’s as if you’re keeping yourself safe and maybe you need to do that. though you certainly convey something else in your writing, some yearning for something beyond the practical and comfortable, as much as those are important. I remember our time together all those years ago on my short visit to Glasgow, very well. I can still see the coffee house and Carrie and my husband, you and I seated together brought together through our writing and yet as strangers. Thanks, Jim. My name is Elisabeth. This blog is my attempt to find a voice after a childhood of silence. I began it in 2006, in the middle of writing for a PhD on the topic, ‘Life writing and the desire for revenge’. A blog seemed a good place in which I might explore ideas about autobiography, as well as practice my writing.